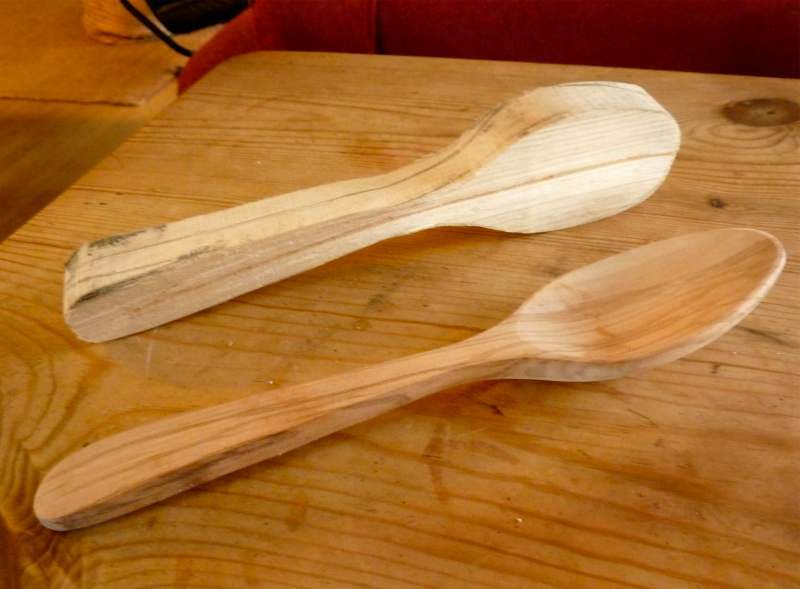 This week I ’ave been mainly carving wooden spoons. 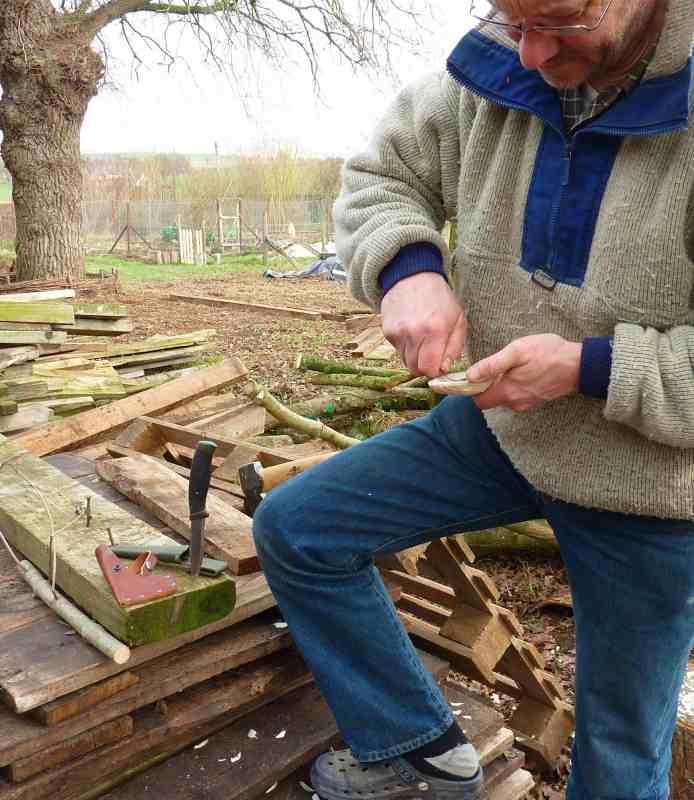 With 11 acres of woodlands green woodworking has long been on my list of things to learn about but, like so many things in our busy smallholding lives, it has remained in the ‘in tray’. The Jan/Feb edition of Living Woods Magazine (link) carried an article on ‘spoon evangelist’ and licensed pedlar, Barn the Spoon. Through his blog I found Ben and Lois Orford’s carving knives and bought a ‘flatter small’ right-handed spoon knife for £27. Then, taking account of the huge prices of his beautiful craft knives was happy to take Lois’s recommendation and bought a Mora Clipper CompanionKnife from The Bushcraft Store for just £10.95. I already had a Gränsfors wildlife hatchet: a sweet little axe with a blade sharp enough to shave with. I also wanted a book, of course, and the spoon carving bible seems to be Swedish Carving Techniques by Wille Sundquist. It’s now out of print and is much sought after secondhand and at a price. Wille’s son, Jögge, has however produced a DVD, Carving Swedish Woodenware, so I settled for that. He’s very muscular, with flowing blond hair strapped back into a pony tail as he throws axes and wields fiercely sharp knives, all the while being terribly serious as he tells us how to “smoothen the wood”. What is most important, and possibly where a DVD can improve over a book, is to show us the all important holds and cutting actions. The basic rule seems to be: think what will happen to the blade if you slip. Jögge shows us how to position our hands and manipulate the carving tools in a way that we should end up with a spoon or dough bowl without being rushed to the nearest casualty department carrying a finger in a polythene bag full of ice cubes. I only half jest: beware these tools have fiercely sharp blades and the wood can take a fair bit of effort to cut. I split a sycamore log with my froe to obtain a suitable ‘blank’, then drew on a spoon shape. Purists may call my next move a cheat but I have a fine craft band saw (given to me years ago by a friend who had no further use for it) and I cut round the outline with that. I used the axe a bit to cut off the bigger lumps, then used the knives. Concentrating on not removing body parts and rewarded by this lump of tree looking recognisably more and more like a spoon, I found it curiously addictive. 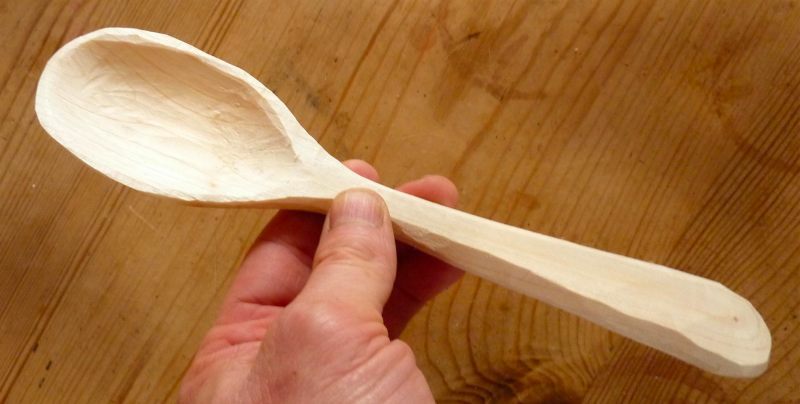 When I felt I’d gone as far as I could, I put this wet-to-the-touch spoon in a dustbin of sawdust to allow it to dry slow enough to avoid cracking. Two weeks later, I retrieved it and started work with some sandpaper. Contrary to most things I try, my first attempt actually turned out rather well, the resulting spoon is deeply satisfying. My second spoon (from a thin, twisted branch of ash) split as I was finishing but the third spoon (more sycamore) is drying and I have a wild cherry blank ready to go, just as soon as I finish uploading this blog. 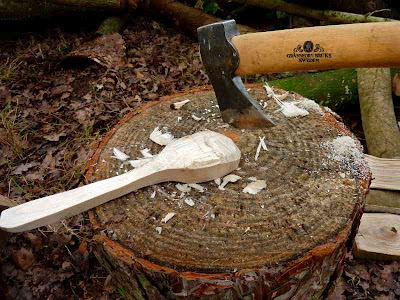 Sycamore is the wood of choice for spoons! 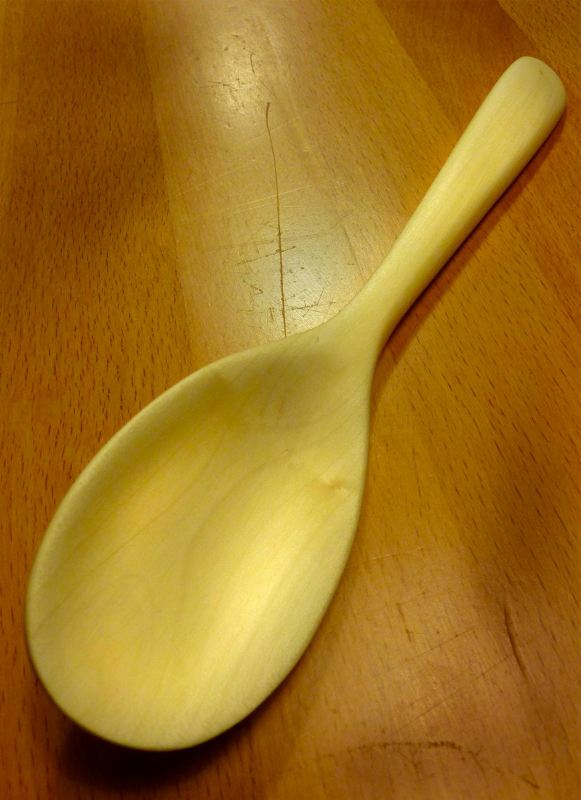 Pete has just made a 5 foot long spoon with a carved message along the handle for a client...but that was to go on a wall and was made of oak! Well I prefer your lovely spoon which we can use in the kitchen. It looks so beautiful and it's great to have another product form our own smallholding. I looked at the price of wooden spoons and spatulas in the shops; Tescos-£2.75 John Lewis £4.50 and that was for a pair of machine made in China.